A difficult species. Adult dark brown below, flight-feathers similarly dark or a shade paler; leading underwing-coverts sometimes blackish brown on upper surface, mid to dark brown coverts sometimes contrast with darker mantle; no conspicuous pale primary-patch above. 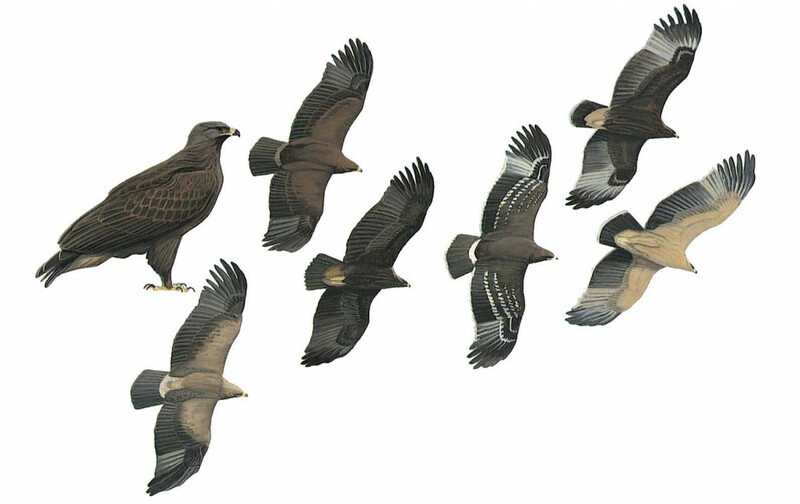 Juvenile is blackish brown below with paler flight-feathers; blackish brown upperwing has 1–3 white covert-bars, often creating pale mid-wing panel; large, diffuse primary-patch formed by whitish primary shafts and pale inner primaries. Infrequently, young Greater Spotted have colour variations on body and wing-coverts. Irrespective of age, secondaries below may have thin dense bars. Adult has relatively broad and parallel wings with a broad hand and deep fingers. Juvenile has narrower hand than adult with trailing edge fairly strongly incurved at body (visible when tail closed).